Manicurists and pedicurists make customers’ feet and hands look pretty. They soak, massage, and moisturize hands and feet, trim and file nails, and apply polish. They may also give their customers advice on taking good care of their nails, and they may suggest and sell the salon’s products. Manicurists/pedicurists are also responsible for keeping their tools and work areas safe by keeping them clean and disinfected to protect customers from getting infected. Manicurists sometimes work with chemicals and need to protect themselves by wearing gloves and/or masks. Being a manicurist and pedicurist is generally a pleasant job because you are making people feel good about themselves, and that creates a happy working atmosphere. You will be working indoors, unless you are providing services to clients in their homes and need to go out to travel. Both full-time and part-time positions are available, but evenings and weekends are the busiest times. About a third of manicurists/pedicurists are self-employed. To work as a manicurist and pedicurist, you must have a state license, except if you’re in Connecticut, the only state where a license is not required. To get the license, you’ll need to complete a cosmetology program and pass an exam. Manicurists/pedicurists should have great people skills and should enjoy working with the public. You should be creative and have a great eye for color. You’ll also need to have steady hands in order to do a good job applying polish. 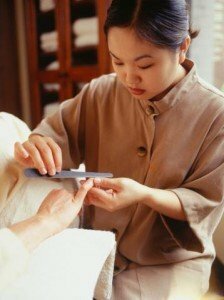 If you think you might eventually want to open up your own nail salon, you’ll need good business skills as well. A manicurist needs a high school diploma or the equivalent and must complete an approved cosmetology program. 1. Graduate from high school or get a GED. 2. Find a cosmetology program that is licensed by your state. There are more than 470 of these programs in the U.S. at private schools and at community colleges. Some high schools also offer cosmetology programs. 3. Complete the cosmetology program. 4. Take the test to get your license. If you enjoy making people look and feel good, you’d probably like being a make-up artist, a hairdresser, a skin-care specialist, a fashion consultant, a personal shopper, or a massage therapist. The average median pay for manicurists and pedicurists is $19,650 per year. That comes out to $9.45 per hour. The Bureau of Labor Statistics says that the job outlook for manicurists is very good! There are now approximately 81,700 manicurists and pedicurists, a number that is expected to grow to 95,300 by the year 2020. That’s an increase of 17 percent, which is about average for the expected increase for all jobs in the U.S.
Jobs will become available when new nail shops open and when people currently working as manicurists leave to do other kinds of work. There will also be an overall increase in the number of manicurists needed because an increasing number of young women — and even some young men — are becoming more interested in getting their nails done and using other grooming services. The manicure business tends to do well even when the economy is bad because many people consider getting a manicure to be an affordable luxury.